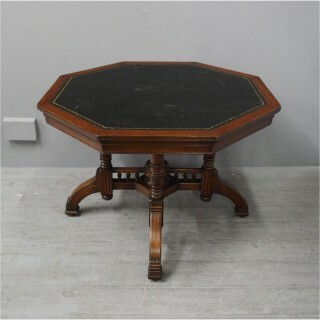 Circa 1880, An oak octagonal library table with gilded, tooled black leather top. It has a moulded fore-edge above the apron, and stands on 4 turned and ring turned legs above a central, reeded cruciform section with balustrades, canted corners and one large finial. This leads on to the continuing sabre legs with reeded fore-edges, scrolling and another downward facing finial before finishing on a rectangular foot on a squat bun.